On January 9, 1859, a remarkable baby was born. Well. It was probably a fairly normal baby, but then it grew into being a remarkable and bold lady. 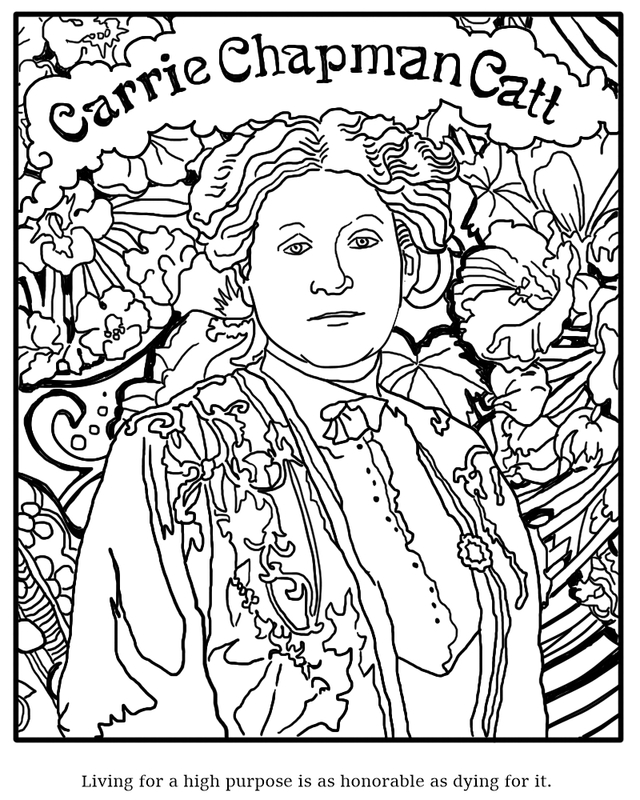 Carrie Chapman Catt founded the League of Women Voters and International Alliance of Women. She knew what was right, and knew what was stupid, and was unafraid to let it be known that she knew. By all accounts, Ms. Catt was intelligent, strong, and self-confident, and refused to follow conventions that seemed ridiculous to her. This means that she is an ideal model of a woman – of a human being of any gender – and we should all look up to her. And we should all print out this free coloring page and color it. This bestie of Susan B. Anthony was great at organization and had grand ideals concerning dignity, world peace, and things of that nature. The League of Women Voters still exists and we will probably join, or at least support their endeavors in some ways – like letting you know about it and by giving you coloring pages. It would appear that we do not have the organizational abilities of this woman, our newest hero. Our newest role model. Color!